Riu Negre. Camí del túnel de Vielha. © Ribera. Servei d’Audiovisuals de l’IEI. Vielha. Vista general des de la pujada del túnel. © Porras. Servei d’Audiovisuals de l’IEI. 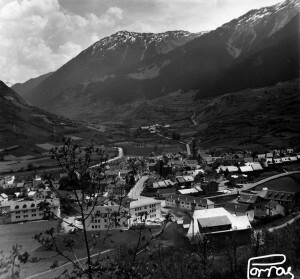 The Val d’Aran was one of the main entry routes for refugees, whether via the customs office at Pont de Rei or via the mountain paths that led from the French departments of Haute-Garonne and Ariège. In this area, escaping Jews received the help and support of evasion networks and the solidarity of many local citizens. Detainees were taken to Vielha and held in the local prison. This was a small building and did not have sufficient capacity to hold the number of refugees who were captured trying to flee to the valley, particularly in autumn and winter of 1942. As a result, some of those captured were held in other places, such as the Internacional, Serrano and Turrull hotels. Many Jews received medical attention at the Hospital de Vielha for injuries resulting from mountain accidents or caused by frostbite and the cold and snow. Some managed to cross the Iberian Peninsula and reach Portugal without being detained, but the majority were captured and transferred to the prison of Vielha and then driven to prisons in the city of Lleida. For all of these refugees, the Lleida Pyrenees were the penultimate obstacle separating them from freedom.